Jerry Kill is 25-26 overall during his coaching tenure at Minnesota. He is quietly confident heading into the 2015 campaign, despite the Gophers' tough schedule. 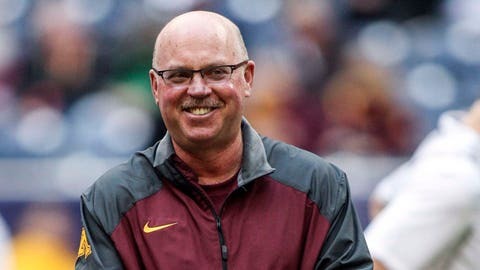 Jerry Kill is sick of seeing Nebraska T-shirts and Wisconsin sweatshirts around the Twin Cities. If he had his way, every sports fan in the Land of 10,000 Lakes would be wearing the University of Minnesota’s maroon and gold. "There ought to be a ban," Kill told reporters on Tuesday. "We need to ban any other shirts but the University of Minnesota and the Vikings. That’s it. "We’re in Minnesota, aren’t we," Kill added. "Right? Alright. I’m off that soapbox." Kill, the Gophers’ fifth-year head football coach, might not need to campaign so hard for fan support a year from now. After all, if the Gophers go to another January bowl game this season — despite a brutally tough schedule — Kill will have made believers out of just about everyone in the Big Ten conference’s footprint. The Gophers, who went 8-5 last year, open the 2015 campaign in grand fashion, against TCU in Minneapolis. At night. On national television. Did we mention the Horned Frogs are ranked No. 2 nationally in the preseason coaches poll? Nevertheless, Kill sounds quietly confident as he prepares to immerse himself in fall camp. Afterall, he likes his roster, which has plenty of veteran leaders and slightly improved overall speed. "Our schedule is very difficult. Everybody knows that," Kill said. "But we’ve got a good football team, too." The Gophers’ defense, for one thing, should be stingy. Kill said this might be the best secondary he’s had during his time in Dinkytown. "It’s a tremendously mature group," the coach noted, mentioning senior defensive backs like Briean Boddy-Calhoun and Eric Murray. "And man, it’s a tight group. "We feel like we’ve built a pretty good defense," Kill added. ". . . I think this will be our best defensive unit." Additionally, the Gophers’ kicking game must come through in close games (perhaps at Colorado State, on Sept. 12, for instance). And, the coaching staff has mild concerns about the interior of the offensive line. But the biggest key to Minnesota’s season might be getting junior signal-caller Mitch Leidner, who completed 51.5 percent of his passes last season, to play with improved confidence. The Gophers can do that by unearthing some playmakers, according to Kill. "Our receivers have got to be able to go make some plays for the quarterback," said Kill. "We need guys to go get the football. "We need some explosion plays on offense," the coach added. Minnesota needs to replace current NFL rookies David Cobb and Maxx Williams at running back and tight end, respectively, but returns a fair amount of talent. One youngster to keep an eye on is redshirt freshman Jeff Jones, a running back by trade whom Kill said should see some action at receiver in 2015. The Gophers’ overall goal in 2015? Simple. "Just be better than we were last year," said Kill, 25-26 overall during his tenure at Minnesota. "And if we’re better than we were last year, I guess we’d be in the Big Ten Championship game. That’s what we need to do, one brick at a time."